There are countless options around for online casinos, but you might be rather disappointed to find out that many of them don’t have great mobile apps. Pair that with the fact that you’re only looking to play using cryptocurrency, and this can significantly reduce your options. The good news though, is that there are some stellar casinos out there that play beautifully on both iPhone and Android devices. This gives you some excellent options for playing on the go, allowing you to test your luck while you’re waiting around at appointments or running errands. Sports fans should check out out guide to the best bitcoin sportsbook apps while Texas Hold'em and Omaha fans might enjoy our bitcoin mobile poker guide. We only recommend well established bitcoin mobile casinos that have been in operation for at least 5 years and have an impeccable record for honesty and fairness. Most of theses casino apps also accept altcoins like Ethereum, Litecoin, Dash, Dogecoin and Monero. Our Android and iOS casino apps also welcome players from countries like the United States of America, Australia and the United Kingdom. You can play slots, blackjack, poker, dice, roulette and other table games anonymously on any smartphone or tablet. We review their layouts, the options they offer to players and how comprehensive their mobile gaming experience really is. Vegas Casino was originally established in 2015, with the goal of providing an amazing online gaming experience to cryptocurrency enthusiasts. They offer players a huge number of different casino games to choose from, stellar customer service, fast withdrawal options and an exclusive VIP program for big spenders that provides access to bonuses, private support options and other benefits. The mobile app for VegasCasino.io is quite nice, but immediately, there’s an annoying little icon on the right side of the screen that just won’t go away. This icon changes the color scheme, which is kind of cool, but it’s pretty distracting to be honest. However, the rest of the layout is excellent. It features some great quick launch buttons to help you get around, a search bar, and the ability to quickly sort the games by provider if you’re looking for something specific. ​Creating an account requires only minimal information and is very straightforward. You’ll also be glad to know that all of the important functions, like depositing and withdrawing are here, so you won’t have to use the desktop site for anything. The game choices at Vegas Casino is vast, and they offer almost anything you could ever want here. This includes a huge number of video slot machines, jackpot games, table games and video poker. They also have a large number of different software providers available too, so you’ll be able to take your pick if you have a favorite provider. If you’re a United States user, then you’ll likely be a bit disappointed here. It seems that they have country restrictions on the live dealer games unfortunately. For those who are not in a blocked country, you’ll be able to play baccarat, blackjack, and roulette, all of which can be accessed from mobile devices. VegasCasino.io allows for deposits and withdrawals in Bitcoin only. The good news though is that their minimum deposit is very low, so you can play with pretty much any amount. The only annoying thing about their deposit procedure is that they seem to have pre-set amounts for deposits rather than letting you enter what you want for some reason. That caps the maximum deposit at 100mB. If you need support, they have a 24/7 live chat available which can help you. This is a pretty great option, because it means you won’t have to wait around like with some other sites if there are any issues with your account’s security. Many players have praised their customer support team’s responsiveness and are quite happy with how they handle any issues. If you’re a VIP, you even get access to a private support team, which is pretty cool! VegasCasino offers some generous promotions, including doubling your first deposit. This bonus is instantly credited after your deposit goes through, which is nice. However, they also have some other goodies for you, including daily reload bonuses, and monthly bonuses to help your losses sting a bit less. This Bitcoin only sports betting site that opened in 2013, also offers some stellar casino games for you to wager your cryptocurrency on. They offer a wide selection of classic games and provably fair games, allowing you to pick your poison. They also allow anonymous gambling, and accept a large number of different cryptocurrencies if you have a favorite that you’d like to play with. 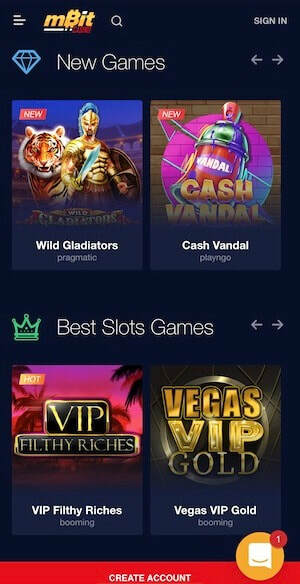 Their mobile app is excellent, and they provide a wide array of gambling choices for those looking for the most options. Betcoin has a quick loading and great mobile layout. The only thing that could be improved is the quick links buttons, which are kind of small. A scrolling icon button style would make navigation a little easier, but it does work just fine for its intended purpose. Creating an account is easy to do, and it requires very little information. You won’t be asked for any identification or personal information other than your email address. Betcoin offers a large number of casino games. You’ll be able to play all of the usuals like dice, blackjack and video slots. However, they also have some more unusual options, including virtual racing games or sports betting options which are kind of neat. Some of the games are a bit slow to load, but they work great on mobile devices once they do. You can also take advantage of free play modes to get a feel for the games before you start betting your hard earned money. Betcoin does offer live betting, but again, the selection will be sparse for United States users. The most infuriating part of this block though, is that they don’t tell you which games you can’t play. You’ll need to check every single one to see if you’re blocked unfortunately. If you’re not in a blocked country, then you can play live versions of games like money wheel, blackjack, texas hold ‘em, baccarat, dice, lotto, and more. Their selection is quite good honestly, if you can play them that is. If you’re looking to gamble with a more obscure cryptocurrency, then this casino might just be your new favorite. The list of currencies they accept includes Monero, Cardano, Ripple, IOTA, and Dash, which are not commonly supported by casinos. There’s also no maximum deposit or withdrawal, so you won’t need to waste your time making small transactions here unlike other sites. All cash out procedures can be handled in-app as well. Support can be easily reached via the live chat function, and they can be reached 24 hours a day. This allows you to quickly get helped if your account has been compromised, without the agonizing wait times of email support. Chat support is available on mobile and desktop too. While Betcoin does offer some deposit bonuses, for whatever reason, they can’t be used on mobile devices at all. This is a confusing policy, and unfortunately, if you want to make use of your bonuses it has to be on a desktop computer. The Bitcoin Penguin platform was launched in 2014, and it’s based and regulated in Costa Rica. They offer players a nice selection of games, but more importantly, they provide instant deposits! This lets you play faster, and with a variety of cryptocurrencies. They provide provably fair games, and they also provide anonymous registration, allowing for you to play cryptocurrency games how they were meant to be played. Plus, with no ID checks, it’s much quicker to make a withdrawal. Bitcoin Penguin’s layout works well on mobile. It’s not super fancy, but it does what it’s supposed to, and it doesn’t load a bunch of junk in your mobile browser to make it hang up like some apps. They’ve got some quick links to help you get around, and they have some links to the games other people are playing at the moment too to help you get started. Creating an account is easy to do, and you won’t be forced to verify your identity ever. All you’ll need is an email address and to choose a password to get started. Bitcoin Penguin has a large library of different games, including dice, slots, card games, jackpots, craps, video poker and more. They load lightning fast, and they play very nicely on mobile! The only bad thing about the games is that they don’t have a free to play mode to test them out, it’s real wagering only here. Their layout on the games page is very nice too. It allows you to quickly filter by provider, game type, popularity and other criteria to find what you’re looking for fast. While there is a live gaming option on the menu, you’ll sadly find that there are no games to play here if you’re from the United States, though you might be able to play with a VPN here, since they don’t ask for ID on withdrawals. If you’re an international user, then you’ll be able to take part in live dealer games of Keno, Blackjack, baccarat, and more. This section can be accessed on both desktop and mobile devices. Bitcoin Penguin is run entirely on cryptocurrency, and they support Bitcoin, Litecoin and Dogecoin. The minimum deposit is barely there, and the maximum deposit is set at undefined, allowing you to drop a lot of money on casino games if you want. Though, cash out is capped at 5 Bitcoin. Customer support can be reached either by their live chat function or through email. The first option will likely be your best bet, as some people have found that their message support can take a few days to reply. Bitcoin Penguin is not quite as generous as some other options when it comes to bonuses, but they do have some 100% and 75% deposit bonuses for your first and second transaction. They’re capped at 0.2 Bitcoin, but they’re no-nonsense, instant deposits that you don’t need to jump through any hoops to get, which is refreshing. You can also get weekly promotions on Mondays and Fridays for free spins and cash back on your losses if you find that your luck has run out. This rewards you for continued play, rather than just upon initial sign up. Launched in 2014, mBit is fully regulated in Curacao. They offer players generous welcome bonuses, and they also provide a VIP program for regular players to take advantage of. They have 2,000+ games, and they provide lightning fast cash out procedures, in as little as 10 minutes even! Players can participate in a wide variety of classic casino games, live dealer options and tournaments to make things a little more interesting. The mBit casino has a great layout. Everything loads quickly and runs smoothly on mobile devices, and their navigation is easy to use. There’s also no annoying floating elements on the screen, except for the live chat bubble, which manages to keep itself out of the way of your gaming experience. Creating an account is easy to do, and they don’t request much information. You’ll be able to play anonymously here too if that’s a concern for you. This casino offers a huge number of different games (2,000+! ), including jackpot games, baccarat, lottery, table games, video roulette and poker. The games also feature demo modes if you’d like to try things out before you spend any real money. All of the games load quickly and play beautifully on mobile devices too. The games page also has great sorting options and organizational features which allow you to find your preferred game or provider with minimal effort. You can also take part in some great community features like tournaments with big prizes, and participate in the app’s leaderboards to prove you’re the best at your favorite game. Yes, they do have some live games, but US players will be blocked, yet again. You’ll need a VPN to even see the games page, and for some reason, they make it difficult to actually find the live games on mobile, but they are there, if you scroll down on the homepage far enough. If you’re not in a restricted country you’ll be able to play games like baccarat, blackjack, roulette, and dream catcher, a kind of “wheel of fortune” type game. Players can utilize a variety of cryptocurrencies to bet with, including Bitcoin, Ethereum, Litecoin, Dogecoin and Bitcoin Cash. They also feature quick deposits and withdrawals, a nice bonus. While they do have a limit on withdrawals, it’s set at 100 Bitcoin per month, which is pretty generous. If you can manage to exceed the limit it’s more like an achievement than a limitation. Customer support can be reached 24/7 via live chat, and most people are quite happy with their responses. Their pending support times are 24 hours or less, making them superiorly responsive to player’s needs. Chat is accessible on the mobile app and desktop site as well. The mBit casino is very generous with their bonuses, and they’ll credit you 30% for every deposit! These are instantly credited, with no strings attached or insane requirements to claim the bonuses. The amounts of these bonuses vary based on the day of the week, and sometimes you can actually get more than 30%. 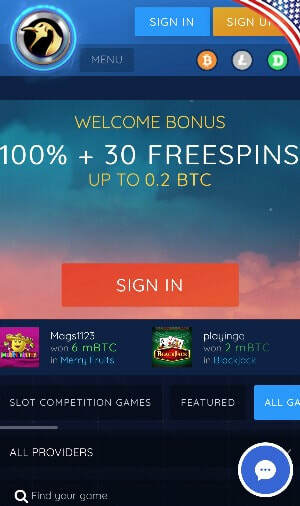 You can also get 50 free spins to test out the app if you want to verify your phone number, no deposit required, but you will need to make a deposit to cash out any winnings you get from using the bonus. It's pretty easy to use any of the cryptocurrency casino apps featured on this site but we've put together a list of common questions for anyone having difficulties. CAN I DOWNLOAD THESE CASINO APPS FROM THE iTUNES APP STORE OR GOOGLE PLAY? Right now none of these iPhone and Android bitcoin casino games are available from Google Play or the Apple App Store because these companies operate offshore and accept players from the United States of America. Both Google and Apple are conservative when it comes to potentially breaking any gambling laws so they do not allow crypto bookmakers, poker rooms or casinos to list their apps on their marketplaces. HOW DO I INSTALL CRYPTO CASINO GAMES ON MY SMARTPHONE OR TABLET? Since these applications are not available for download from Google Play or the iTunes App Store, you simply visit the casino from the Safari or Chrome browser on your phone or tablet and start playing the games instantly. If you want quick access to the games at a future date, we recommend you use your browsers "Add To Homescreen" feature to add a button to the home screen your iOS or Android device. There are certainly plenty of scams out there in the world of online gambling and the problem is even more severe with cryptocurrencies because you can't request a charge back or report a fraud like you can when you deposit with a debit or credit card. For this reason, it is vital that you only gamble are reputable crypto gambling sites that have a proven track record for honesty, integrity, fairness and great customer support. There are well over a hundred different crypto casinos operating today but we only feature these apps because they are from reputable companies who are licensed and regulated in countries like Panama and Costa Rica, where most offshore bookmakers and casinos are located. WHY ARE SOME GAMES NOT AVAILABLE? Most online casinos don't develop their slots, blackjack or roulette games in-house. Instead they license them from various games providers. These games developers impose restrictions depending on where they are based. A games provider located in the United Kingdom, Europe or the United States are unlikely to allow players from the USA to play their games due to fears of legal problems. Unfortunately, many live casino games are blocked to players in the U.S. 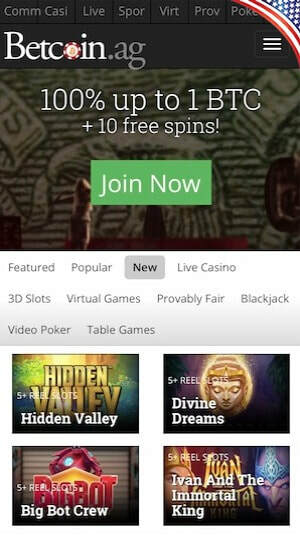 Yes, all the Android and iPhone bitcoin casino apps featured on this page allow you to create a new account without having to provide any identification or utility bills. Some may ask you to provide an email address so if you are very concerned about privacy, we recommend you create a disposable web email address rather than using your work or home email account. WHICH GAMES CAN I PLAY WITH THE APP? While most of games that you can play on your PC and Mac will be available on iPhone and Android too, you may find that some are not. This is mainly because the games were developed using flash, which is not available on iPhone or iPad and some Android devices. Games developed using HTML5 should be playable from any tablet or smartphone. ARE CRYPTOCURRENCY CASINO APPS LEGAL? Most Bitcoin, Ethereum and Litecoin casinos tell their customers that it is their responsibility to check their local laws. If it is illegal to gamble with dollars, euros, pesos or pounds in your country, then it's probably also illegal to gamble with crypto.